The Saints began ordering custom engraved baseball bats in 2007, and have ordered bats from George and George, Inc of Engravedtolast.com every year since. 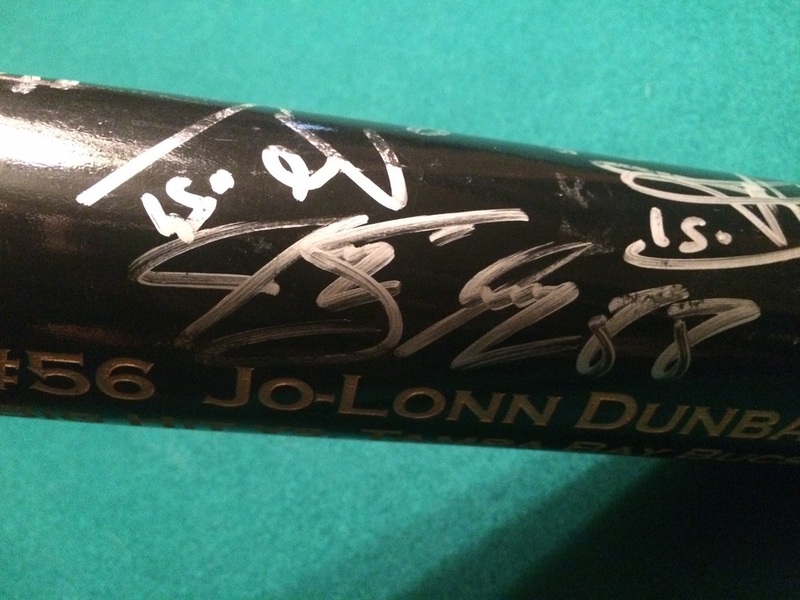 Pictured below, is a bat that was presented to one of my favorite Saints defensive players, Jo-Lonn Dunbar. 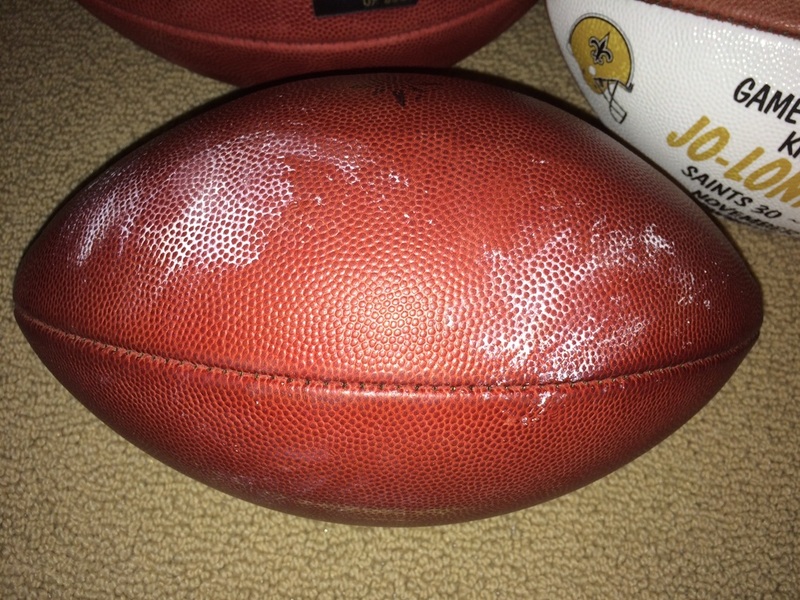 It is a "Big Hit" bat dated to the first game of the 2008 season, Dunbar's 1st NFL Game. 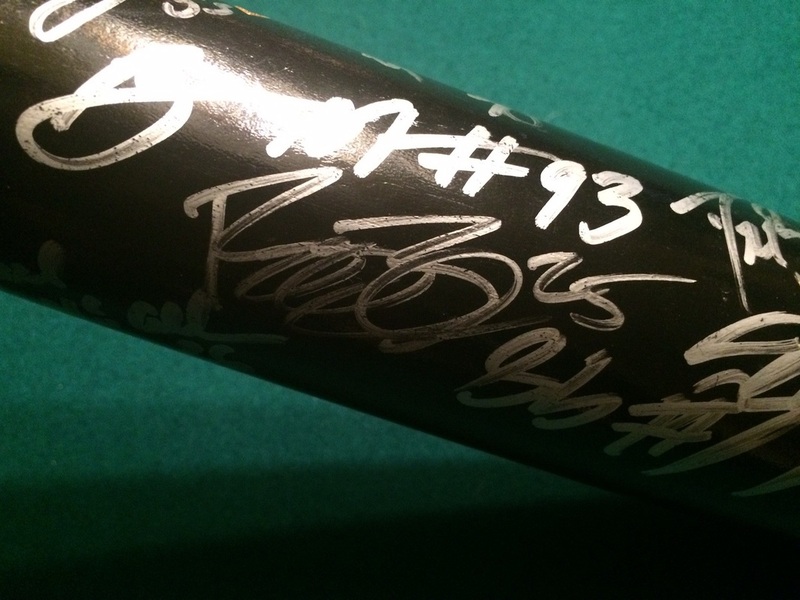 Autographed by 30+ player of the team, additional pictures show a few of the autographs up close. Engravedtolast.com stamped on bat, pictured below. The Saints began ordering these bats in 2007, this 2008 "Big Hit" bat detailed above is the earliest player issued bat that I've seen. 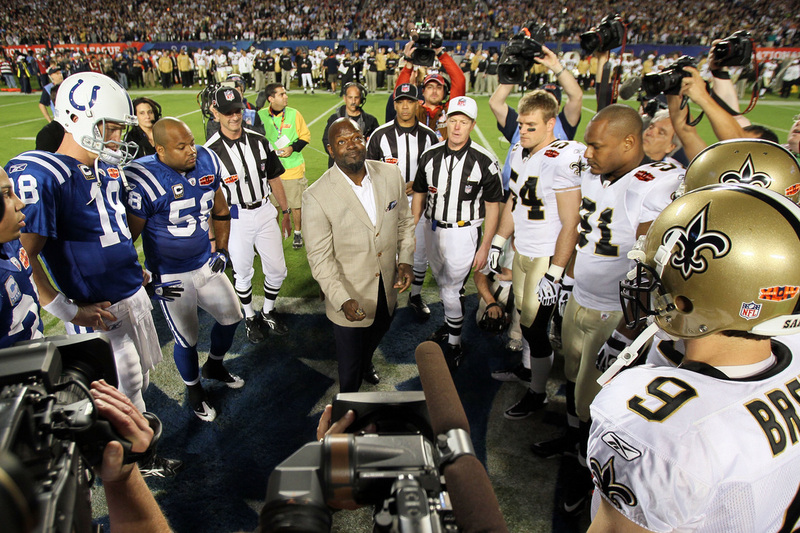 In 2009 the Saints ordered 4 different "Bring the Wood" bats for games against the Jets, and post-season games vs the Cardinals, Vikings, and Colts. 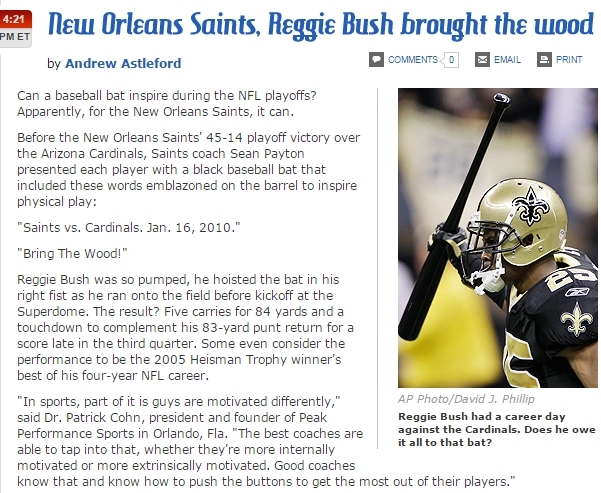 These presentation bats became famous when Reggie Bush showed these bats off, leading the team onto the field on 1/16/2010 against the Cardinals, where they would further advance in the playoffs, and Bush had a career game. After the win against the Cardinals during the playoffs, the bats became well known among Saints fans, and were seen as a symbol of the team that year. ​ The "Who Dat" bat company would also form to sell their own replica retail versions of the team issued bats. Seen below, then Mayor of New Orleans, Ray Nagin is holding a "Who Dat" bat company "Bring the Wood Bat" during the victory parade. The entire team, as well as members of the Saints staff, are given these "Bring the Wood" presentation game bats for specific games. Whereas the "Big Hit" bats and individual "Bring the Wood" bats are also given out to individuals for achievements. Such as this Thomas Morstead bat pictured below given for the Single Season record of 68 Touchbacks during the 2011 Season. I've run across these bats pictured below being sold at various times online. I've been told engraved baseball bats have been ordered by the Saints since 2007, and the bats have been ordered by the team every single year as of 2015. Dennis Allen, was the Defensive Line and Secondary Coach for the New Orleans Saints from 2006 to 2010. Allen became the head coach of the Oakland Raiders in 2012, and he would use the "Bring the Wood" bats to motivate his players before a few games in 2012 and 2013. 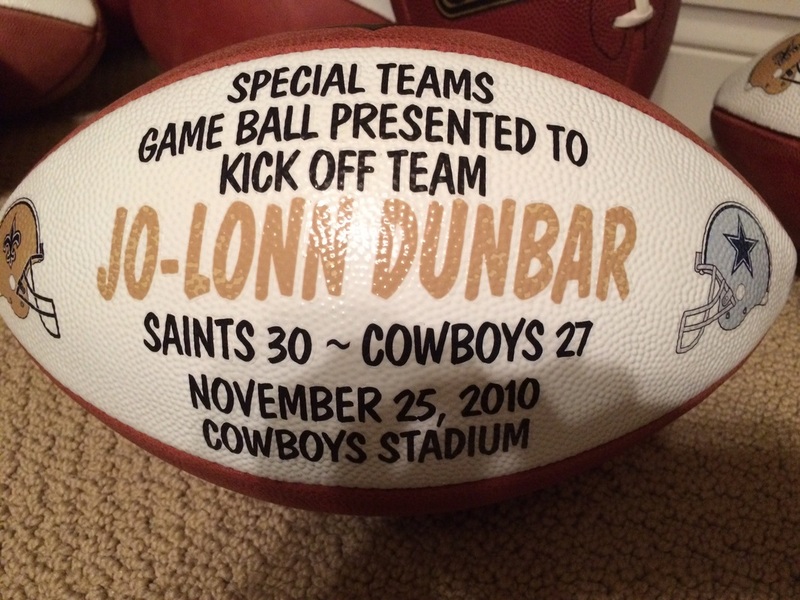 Below are 3 presentation game balls presented to Jo-Lonn Dunbar and photos and an article related to those specific games. 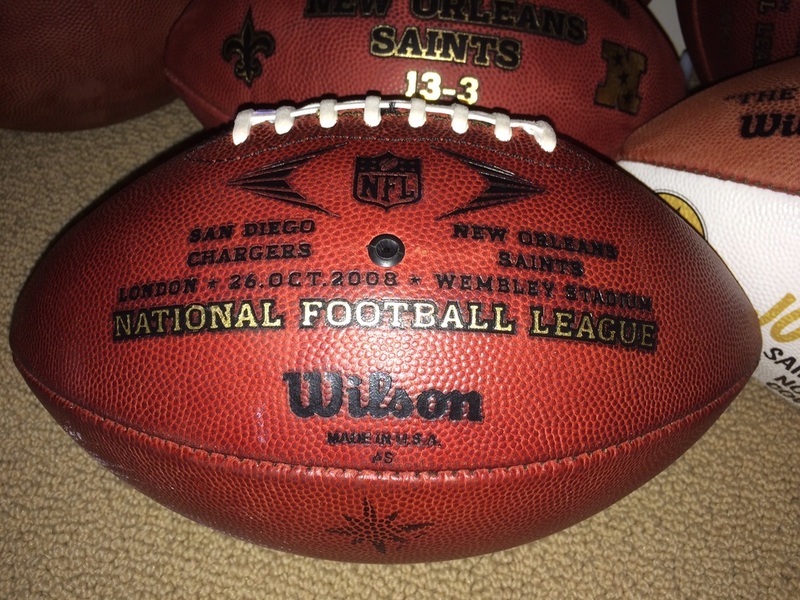 Below commemorative retail model footballs for the 2009 NFC Championship game and Super Bowl XLIV. 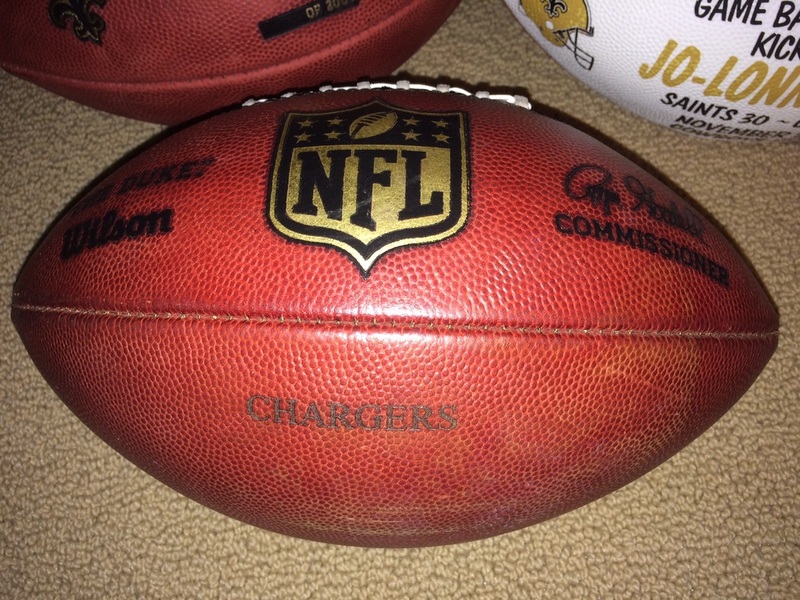 Football used by the Chargers offense. The Chargers mounted one last drive in the dying moments, but a Rivers pass was intercepted by Jonathan Vilma with a minute remaining to end the game.